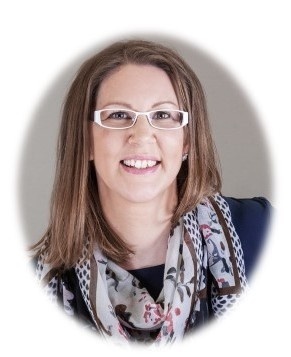 MedTech as a business is changing and getting more diverse. For example, the technical complexity, forms of digitalization and regulatory requirements are something that are increasing as we speak. At the same time there is a pressure to lower the costs, improve quality and get to market even more faster. We think that almost every medical device OEM designing and developing medical devices nowadays has faced or will face these issues. 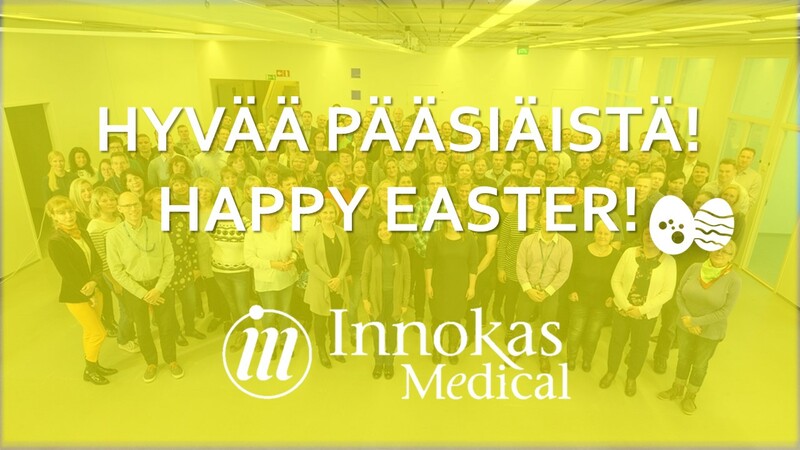 That’s why we’ve started to look for and define the elements, which have an effect on how to achieve more agile medical device development cycles while at the same lowering the total costs and ensuring the high quality of your product. We see the base for this is built on three important cornerstones: co-creation, standardized working methods and solid domain expertise together with related competences. How and why? Let’s look at these a little more. The increased industry complexity has caused that partnerships emphasizing close cooperation over the entire product life cycle have become more significant driver for competitiveness. This kind of cooperation is called co-creation, which is an organizational model bringing together all the participants from end-users to experts for developing new products or services. 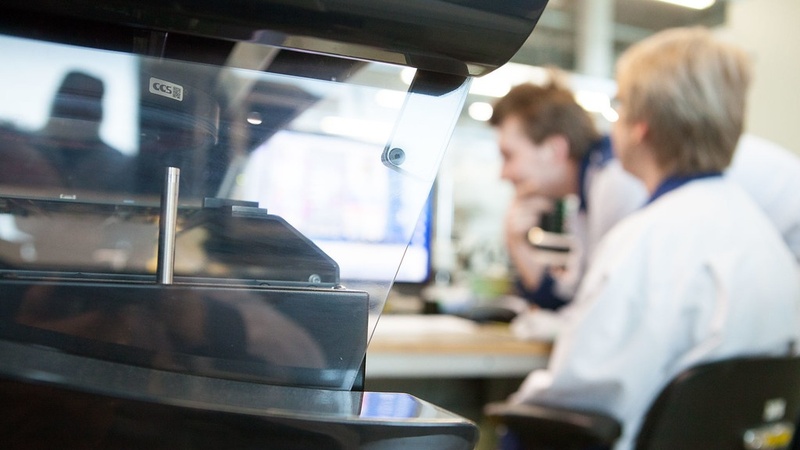 By co-creation, companies are able to take into account the changes and challenges of more complex operative environment efficiently, when at the same time ensuring the agile development cycle for next generation medical devices. We believe in co-creation so truly, that we even argue that companies who are unable to change their mindsets and organizations, are doomed to failure as they cannot run along with the competition. In much more complex industry, an equipment developer may not be able to recruit the right expertise at the right time - despite the fact that it intends to keep all the knowhow in house. As a result, such a company may not remain competitive in the end. By co-creation, all parties get a competitive edge and are able to add more value compared to the previous business models. Therefore, we see co-creation as one key element to get certified, high quality medical products to the market quickly and smoothly. When co-creating next generation medical devices with experts in the field, both total costs and development time can be saved. The end result is also better outcome than in the traditional organization, as in this model the company selects the partners it needs in order to ensure the required expertise and assets are available. In addition to co-creation, companies should pay more attention on the standardized working methods, meaning the ways medical technology products and services should be created in the future. For example, modern tools and high-quality processes are something that are truly needed. In addition, we see that the future medical device development is becoming similar to the lean start-up and agile development methods. 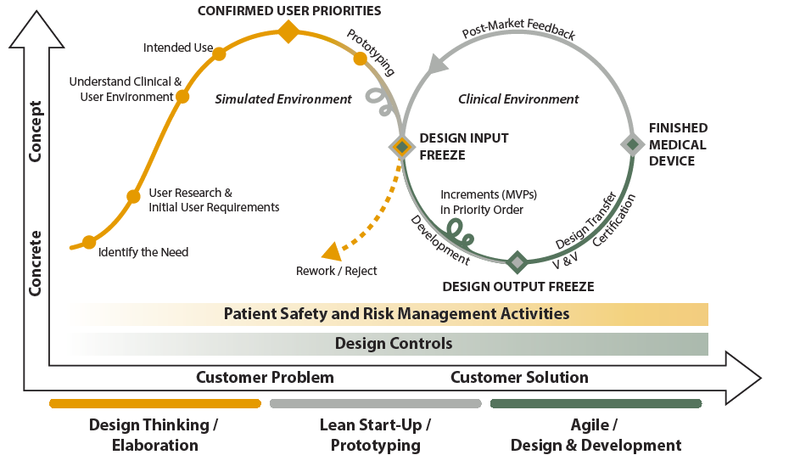 Thus, we’ve started a discussion lately where we’ve stated that one answer to shortening the development cycle of medical products is to apply three commonly known methodologies of product development to medical devices: Design Thinking, Lean Start-up, and Agile. We see that this kind of renewed product development model brings more agility. When done properly, aligned with development process and tooling, it reduces the time to market of the device by ensuring that right and well specified customer problem will be solved with a feasible solution, which is going to be incrementally developed. PSST! If you want to learn more about these methodologies in medical environment, please collect your White Paper from the end of this blog post! In addition to co-creation mindset and standardized working methods, it cannot be stressed out too much that it really matters which kind of co-creation partner you choose. The domain specific expertise and related competences of your partner is something that really matters: choose the one with more clearer benefits and more added value for your business. We see that it is also very important that your partner is able to show you in a concrete way how they can help you to solve your problems and how they can improve your company’s business situation. As an example, please see below a framework we’ve created to illustrate that. 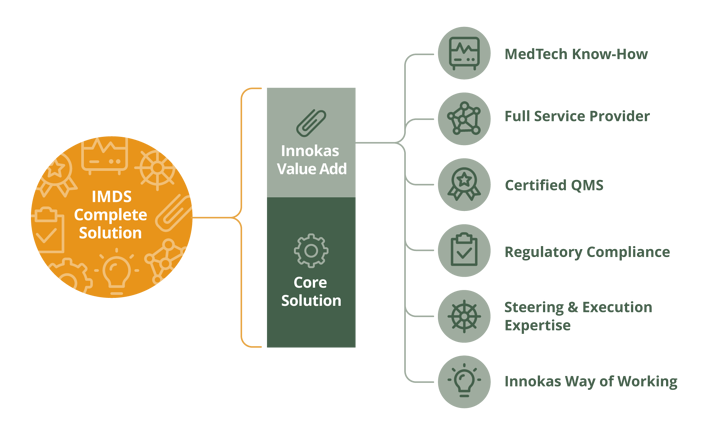 This framework illustrates the additional benefits Innokas’ MedTech Design Studio is able to offer to customers through our domain specific expertise and related competences. We think this kind of illustration is an ideal way to visualize the added value and concrete benefits the partner can offer through its expertise besides the core solution. The base for this is, of course, the co-creation, where you select the partner you need in order to ensure the needed expertise is available when you’re designing and developing new innovations. But please, keep in mind that it really matters what kind of expertise is available! But let’s take a closer look on that picture through two point of views: through the domain specific expertise and through the domain specific competences, which are, in our opinion, the most relevant matters to check out when choosing the most optimal partner. One concrete advantage that surely benefit you as a customer is your partner’s long-term MedTech know-how. Through the long-term experience in medical business, your partner is surely gathered extensive knowledge e.g. in medical device development, in regulatory requirements as well in the implementation of use scenarios and user needs both in hospitals and home care. This helps you already at the idea phase of your product, because it is very important that your partner is able to consult you already at a very early idea phase of what could and what shouldn’t work helping you to ensure that the right things are being done at the right time and in a right order. This will surely speed-up the product time to market. The deep experience the company has from the field, allows you also to focus on your own core strengths. The same benefit can be offered through your partner’s certified QMS and through the strong experience the company has gathered from medical device related regulations and standards of different market areas. For example, the company’s certified QMS and processed built according to them, guarantee that your products are high in quality and follow all the needed laws, standards and requirements. You should also make sure that your partner is actively investing and contributing in best practices and ways of working – like in their processes, tools and inner competences. Usually, this will ensure more agile, cost-efficient and flexible way of operating for both parties. In addition, the knowhow your partner has been able to create within the steering and execution excellence in wide variety of different medical device projects matters as it helps you as a customer to count on your partner’s reliable project planning and proactive risk management. And there is one thing, of course, that cannot be stressed out too much; wide competence pool as a competitive edge. 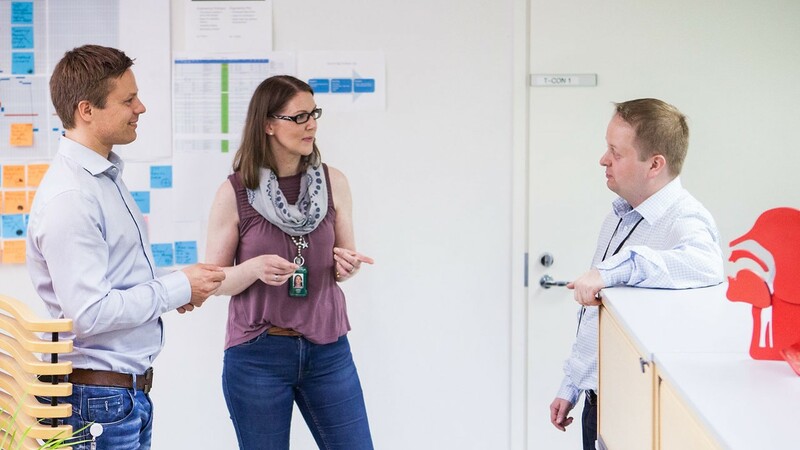 When you as a medical device OEM are utilizing full service providers when choosing a partner, the more agile product development cycle as a whole can be achieved. We see that the early involvement of both Manufacturing Operations and QA&RA functions guarantee that all the quality, regulatory and domain specific requirements as well as sourcing and manufacturing needs are considered already in the early phase – and during each life cycle phase of the product, of course. This ensures that the right things are being done at the right time and in the right order, which speeds-up the product time to market launch as a whole and reduces the total cost of the product. We see that the best outcomes in the future are achieved through the value add of strategic co-creation partnerships where more added value and more concrete benefits are delivered. Through this kind of co-creation partnership, every party can ensure that all the business-related complexities but also the regulatory requirements are met during each life cycle phase of the product, while at the same time speeding-up the time to market launch and reducing the total costs of the product. And as stated above, our two cents are to choose your partner wisely. Ask them to show you the concrete benefits they can deliver to your business. This is the way to save both money and time when developing next generation medical devices to the market. PSST! The discussion above related to the three methodologies in medical device design and development was only a small view to the topic. If you want to learn and read more, we've created a Free White Paper, in which we’ll describe in a very detailed level how to get high-quality medical products to the market as quickly as possible by utilizing product development model, which is based on Design Thinking, Lean Start-Up and Agile. The illustration above (picture #1) will be also described and discussed from checkpoint to checkpoint. Collect yours by following the link!